Some Humble Thoughts on Our Beloved Srila Prabhupada…. Try to understand what happens when someone surrenders to Krsna. The modes of nature disappear. Srila Prabhupada is not in this world, but has a direct one-on-one relationship with Krsna on a moment to moment basis. Every moment Srila Prabhupada speaks, every word, is transcendental. Whatever he is saying, we can understand that somehow it is true because it is spoken by Krsna through him, even though our so-called intelligence wants to convince us otherwise. He is never like us, who sometimes repeat some scripture and sometimes make statements while drawing on our culture, or mundane education, our personal opinions, etc. This is because we are ordinary men who are subject to material nature. We still believe all of our nonsense ideas. Srila Prabhupada, on the other hand, is part of a transcendental world and in this transcendental world there are still ideas about women, marriage, relationships, intelligence, friendship, etc., and Krsna is there and He has created these standards of life. So when someone here on earth who resides in the spiritual atmosphere is talking about some seemingly ordinary subject, we can not say that, because we cannot find that exact quote in the written scriptures, it is part of the material vibration. 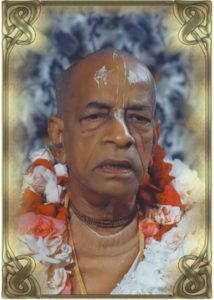 For his entire life Srila Prabhupada has never known a sinful act, and he has also revealed to us confidentially that never was there a moment that he can remember that he was forgetting Krsna. All that time in his life he was developing spiritual knowledge and engaging in devotional service, along with securing the minimal everyday necessities of life. And all that time he was hearing so much information about the realities of life within the atmosphere of the spiritual kingdom, and was being blessed so much by hearing repeatedly from realized souls about the true nature of everything, even ordinary things in life such as women, war, proper behavior, treatment of a guest, etc. Therefore, when he speaks to us, he is drawing from this vast storehouse of spiritual knowledge, which includes both information of how to develop pure bhakti and also information concerning the realities of ordinary things like living in society, relating to others according to their position, and everything else — not from a mundane perspective, but from the perspective of a pure devotee who is with Krsna at every moment and who is living in the spiritual atmosphere. He is showing us how to live in Krsna consciousness and how to think according to the Vedic version of life. Don’t forget the fact that in order to preach, the first class pure devotee descends a notch in order to speak from the perspective of a second class pure devotee. But that does not mean he has become less. It is a sacrifice for the purpose of preaching. Srila Prabhupada is still Krsna’s fully transcendental confidant. He is never like an ordinary man. So we can just relax our brains, throw our PhD certificates in the trash, and give up our dependence on the logic that gives our teeny brains it’s “reality”. Instead, take this rare opportunity to submissively hear the transcendental sound vibration coming down from the spiritual world through every word from Krsna’s confidential emissary. But, for the process to work we have to give up our puffed-up arrogance. It requires great submission and taking the posture of a great fool who is barely qualified to even wash the shoes of the actual luminaries like Srila Prabhupada. And we have to very carefully guard against the mad elephant who will wreak havoc as soon as we dare to minimize Krsna’s dearest friend and spread doubts and confusion among the Vaisnava community by making statements that diminish faith in both the revealed scriptures and the unalloyed devotee.